Last year, my second graders planted potatoes. 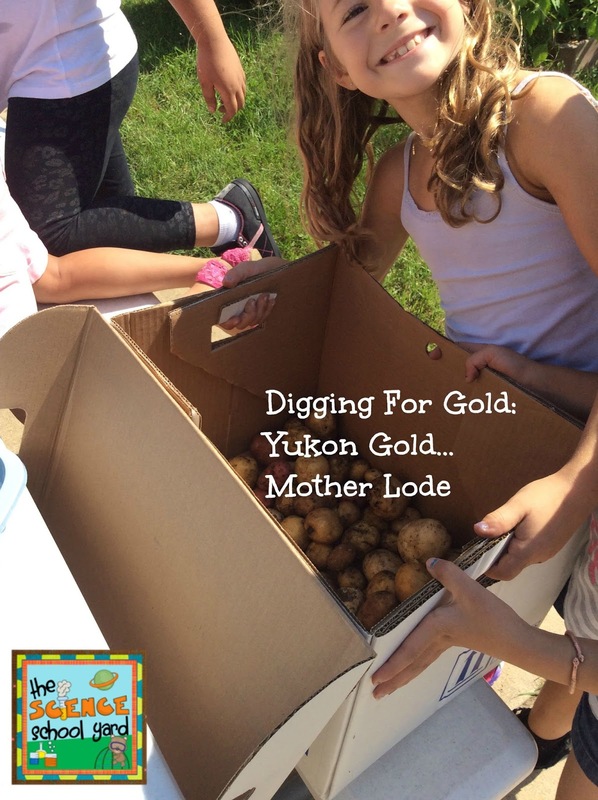 Little did they know they would be digging for gold...Yukon Gold to be exact. 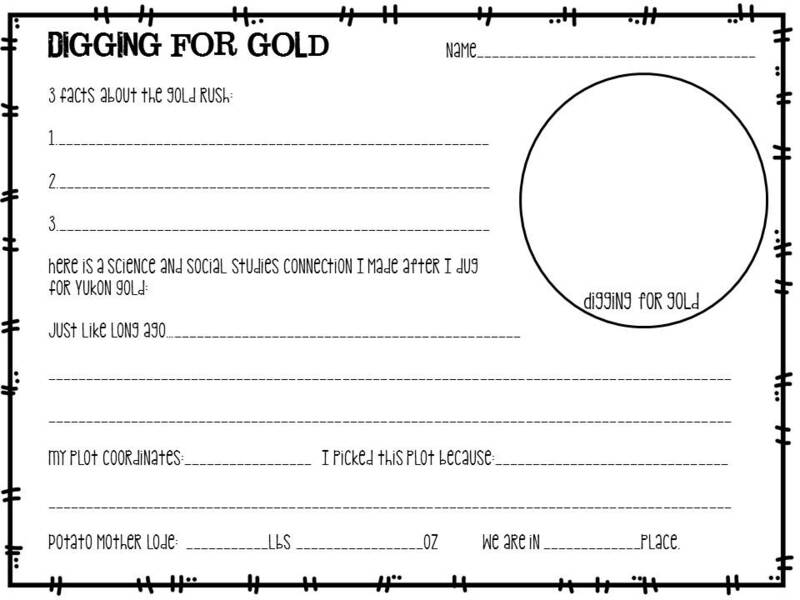 This little lesson is a great way to teach the gold rush, measurement, and Earth Materials. Here is the Freebie Link For You!! 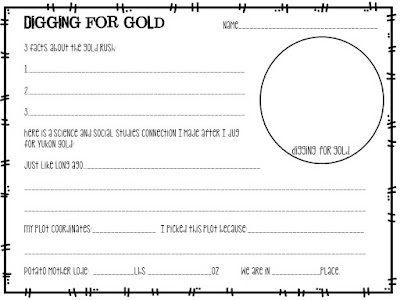 First...I had the kiddos come in and get them excited about digging for gold. I put the book Gold Rush on Epic books up on the Smartboard. 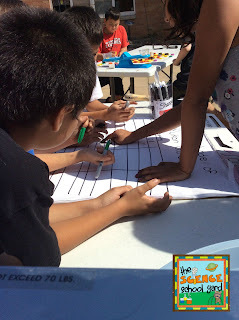 I shared the book and compared what they would be doing outside. When the story was done I had each student pick a card: either I will get to California by boat or I will get to California by boat. They found a partner with the same card. (Just a fun way to find a new partner....) The boaters got to pick a tool at the mercantile...then they were off to stake their claim (using spoons with their names on them as their stakes.) Each spot was in a grid pattern. Marking a grid in the potato patch...staking a claim...and digging for gold! 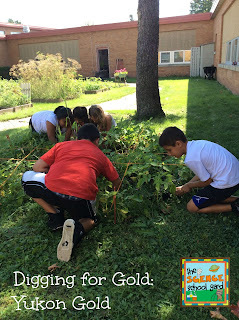 The students had a set time to dig for gold. The boaters got three extra minutes in the garden...finally the covered wagon crew. When they found gold...it was magic! Look at that gold! This is a great way to start our FOSS Earth Materials unit! Digging in the Earth to find rocks and minerals! Next, we needed to see who had the "mother lode"! We spend two weeks learning how to use a scale and measure in grams. Once again using a garden helps tie in social studies, science, and math! 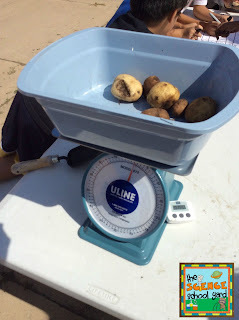 Using a scale to measure how much each prospector was able to find was a great connection to math! Next, it is time to record our weights on our graph. Keeping record allows us to see which group out of 4 classes doing this activity actually hauls in the "mother lode". You can see some kiddos in the background even weighing their potatoes again! 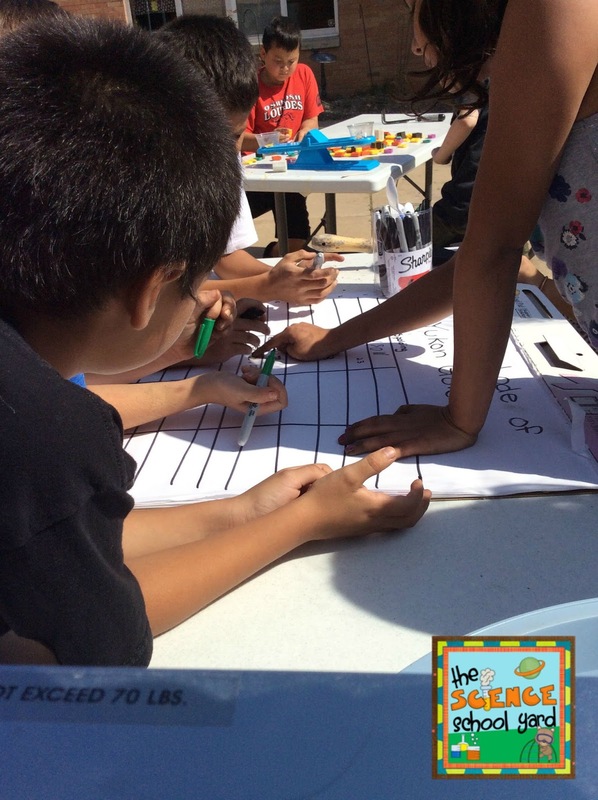 How exciting for the kids to reap the benefits of what they planted in second grade in a great lesson about history! 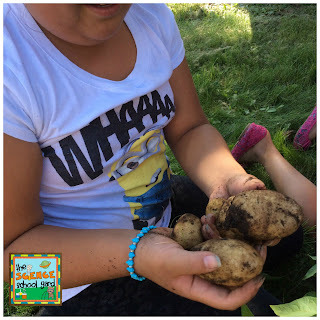 Prep: gridding a potato patch, getting spoons ready with markers, setting out a mercantile with tools, printing sheets and cards up, letting them dig, having them measure, then reflecting on learning. A highly productive lesson to teach science...social studies...and math! I love that we could use our school garden in such a successful way. These potatoes will be our September Harvest of The Month!